Chiwetel Ejiofor (right) recreates Solomon Northup’s slavery experience with brutal honesty in the film adaptation of Twelve Years A Slave. Twelve Years A Slave is a landmark book for what it helped to overthrow. Adapting it to the big screen is a new challenge. Did the attempt from British director Steve McQueen work? The movie begins with Solomon Northup in captivity. However it flashes back to when he lived as a free man in a town in New York. New York was a free state during the days of slavery and blacks were free even to the point where they could be businessmen. However he was tricked during a trip one day by slavetraders into touring with the circus. He was drunk that night and the following morning he finds himself chained to a floor and beaten. He was forced through brutal punishment to accept the name Platt and was sold in New Orleans to plantation owner William Ford. His first experiences as a slave were not bad under Ford. Ford actually treats him with enough respect for Northup to give him a violin in gratitude. However things change when his boss becomes carpenter John Tibeats. Tibeats is terrible as he mocks all his slaves but takes a special dislike to Northup. Tensions go from Tibeats harassing Northup to the two fighting to Tibeats getting his men to hang Northup. Ford notices this and sells Northup away from Tibeats to cotton planter Edwin Epps. Both Ford and Northup know Epps is cruel to his slaves and believes his right to be cruel to them is in the Bible. Northup insists to Ford that he’s a free man but Ford believes it’s not for him to say because he has a debt to pay. 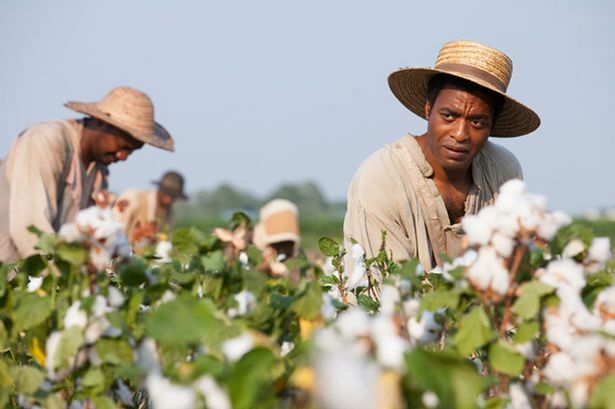 Epps places a demand on all his slaves they pick 200 pounds of cotton a day or be whipped. Throughout his stay, he is subject to brutal treatment from the Eppses and even a plague of the cotton worm where he and the other slaves are sent away to a temporary field. He is even betrayed in his attempts to freedom and has his letter to New York burned by Epps. Meanwhile Epps is observant to the other brutality going on. Most notably to the female slave Patsey. She is excellent at picking cotton but has caught the jealous of Edwin Epps’ wife who repeatedly beats her. Edwin himself rapes her repeatedly and worsens over time. Patsey’s mental condition worsens to the point where she wants a suicide and even welcomes a whipping from Solomon ordered by Mistress Epps. There is a ray of hope as Northup works construction along with a Canadian named Bass. Northup knows of Bass’ opposition to slavery by how much it disgusts Edwin Epps. Northup confides to Bass of his experiences. Northup again attempts a letter to pass on but Bass agrees to do so despite that being a risk to his life. The movie ends on a bittersweet positive note and provides information on what happened after the novel was published. I’ll admit I’ve never read the actual book ‘Twelve Years A Slave.’ Nevertheless I consider it an accomplishment to bring it to the big screen for the first time. It gave an excellent depiction of the horrors and brutalities the slaves went through during the times of slavery. Those who don’t know all the details of what was all involved with slavery other than simply owning black people don’t know all the details. The movie in itself was a recreation of the slave life Northup experienced. This is a life that Northup experienced and witnessed and was a life with thousands or even millions of slaves experienced in the United States. It will shed quite a light and will give all the reason why slavery had to be ended. It will also surprise you with the fact that Solomon was one of the few slaves to escape to freedom. It will even cause you to think of the slaves that weren’t lucky enough to be free. One thing that made me question was the state of slavery laws at the time. I may be Canadian but I knew of the Dred Scott Decision that had a bearing to the Civil War and the eventual end of slavery. What surprised me is that Northup was a free man living in New York State when he was kidnapped and sold off to Southern slave owners. That had me thinking there must have been some laws against kidnappings and even selling of African Americans from free states. I’m actually surprised to see that kidnappings of free black people by Southern slave traders happened back then. Makes me wonder if there were those that unlike Northup never got their freedom back. Another thing that caught my attention was the scene where Edwin Epps whips Solomon mercilessly. A white man tries to stop him but he rejects, saying; “he’s my property.” It’s a reminder of the reason why African-American slaves were treated so abhorrently. The white owners looked at them as property that they can do whatever they wanted to them. They could whip them all they wanted or even kill them. They could even be raped in the case of Patsey. None of it would matter because they weren’t considered people. They were considered ‘property.’ And one thing that will strike you once you leave the theatre was how much the Southern states treasured slavery. This was something they valued to the point that when it became clear slavery would end in the United States, they declared their own nation: The Confederate States of America. They would even fight a brutal Civil War over four years with hundreds of thousands of soldiers killed for the sake of keeping their slavery, in which they’d eventually lose. Really makes you think. The biggest accolade for the efforts given to the film have to be given to director Steve McQueen. Steve is actually a mostly unknown director in the past who had previously directed two previous feature-length films and 23 shorts. Watching Twelve Years A Slave will cause many including myself not to believe this is only his third feature-length. This is excellent and impressive. He did an excellent job of recreating the story and also bringing out excellent performances of actors famous, well-accomplished and those short on experience. What’s also surprising is that Steve McQueen is not African-American but British of Grenadian descent. I too find it surprising that it’s a black British director that has best depicted American slavery to the big screen. He already looks poised to become the third black director to be nominated for a Best Director Oscar. Not even Spike Lee was nominated in that category. The big buzz is will he win? If he does, he’ll be the first black director to do so. The acting was also excellent. Chiwetel Ejiofor was excellent as Solomon Northup. It was not only of what he said and what he did but also what he witnessed that made his performance of Solomon. Supporting performances were also excellent too. Lupita Nyong’o was the one that stood the most out as Patsey: a slave that’s as tortured inside as outside. This is actually Lupita’s feature-length film debut. Excellent work. Michael Fassbender was also excellent as Edwin Epps. His jerk attitude made him that hateable. Sarah Paulson was also excellent as Mistress Epps. Even though her role didn’t have as much dimension as Edwin, she was just as hateable. Both made it look like the Eppses had a lust for blood and abuse. Even the performances from Benedict Cumberbatch, Brad Pitt and Paul Dano added to the film. John Ridley did an excellent job of adapting Northup’s biography to the big screen. This is surprising as Ridley has more of a reputation for writing for television comedy. However he did write the story for 1999’s Three Kings. This was an excellent job for him. Sean Bobbitt did an excellent job of cinematography and Hans Zimmer did a great job for composing original music. Twelve Years A Slave is an accomplishment of a film. An accomplishment in both acting and directing. The story may be too unwatchable for some but its brutal honesty is its best quality and help make it one of the best films of 2013.